Milk, of course, is designed to promote growth- specifically, the building of baby mammals. Curiously, the process of repair often mimics growth, and that's undoubtedly how raw, grass-fed milk has earned its status as one of the world's most powerful healing foods. Eminent Canadian physician, Sir William Osler ( below, right 1849-1919) recommended it as a valuable aid in treating many serious diseases, often calling it 'white blood.' Today, an incredible array of milk-derived supplements are available for those seeking relief from disease or to improve their health in general. Missing here in America, however, is one special substance, immune milk, that could revolutionize medicine and healthcare, but which, like raw milk, is largely suppressed. We'll get to that in a bit, but first, some background on just how raw bovine milk products can foster growth and healing. All mother mammals want their offspring to thrive- that's one of the basic laws of survival, but how nature assists with this is nothing short of remarkable. Depending on the species, mom either passes on a little or a lot of her immune system to junior via the first milk she produces. But not just any milk. There's a special name for the rich, yellowish broth of proteins, immunoglobulins (antibodies), lactose, growth factors and anti-microbial agents that make up baby's earliest meals: colostrum. In the 1920's, Italian pediatrician Luigi Spolverini (below, right 1873-1965) echoing what millions of farm families had known for hundreds of years, advocated colostrum for use in treating infants. Immunoglobulins IgG, IgA, IgM, IgE, IgD: Large, complex sugar/protein (glycoprotein) molecules (also known as antibodies) used by the immune system to find and deactivate pathogens such as bacteria and viruses. Transforming Growth Factor Beta: Stimulates growth and repair of the gastro-intestinal tract. Epidermal Growth Factor: Biochemically regulates cellular growth, cellular division and cell type. Fosters rapid tissue repair. Glutathione: Powerful antioxidant that offers protection to cells from free radicals. Interferons: Specialized proteins that inhibit replication of viruses within cells throughout the body. Interleukins: A large group of signaling molecules that help regulate the immune system. Oligosaccharides: Groups of 3-10 sugar molecules that protect against pathogens by competing for binding sites on the intestinal epithelium and provide support to friendly probiotic bacteria. Proline-rich Polypeptide (PRP) or Colostrinin: Anti-inflammatory hormone that helps regulate immune system activity by stimulating the thymus gland. Transferrin: Immune system glycoprotein that binds free iron, which, in turn, inhibits bacterial growth. In cows, newborn calves import up to 90% of their immunity to pathogens and disease from the first 24 hours of suckling. Human newborns get the bulk of their mother's immunity transferred to them prior to birth (across the placenta) but still need that first colostrum to optimize their immune systems. Gentle reminder for all you mothers-to-be out there: whatever you do, make sure your infant gets its fill of your first milk, then continue to breast feed for as long as you can. Fortunately for calves (and us), their mothers make a surplus of colostrum, roughly 6 gallons (22-24 liters) in the first 24 hours alone. After that, the concentration of antibodies and other factors tapers off quickly to the levels found in regular or 'mature' milk (see graph, below). The immune factors in colostrum are highest in the first 12 hours, because calves are born with what are, essentially, 'leaky guts.' That is, their intestinal tract is porous to the large immunoglobulin molecules which are transferring their mother's immunity. To get full protection, they need 2-3 gallons of the richest colostrum before their gut lining closes completely, around 24 hours of age. Incidentally, this property is what makes colostrum so useful in healing damage done to the intestinal lining caused by non-steroidal anti-inflammatory drugs, or NSAIDS. So, can humans actually take (and benefit from) bovine colostrum? As mentioned above, generations of farmers know the answer to be a resounding 'Yes!' The plethora of ads hawking supplements that contain it, and the thousands of scientific studies backing up the seemingly miraculous claims, all appear to confirm that the magic it works in cows applies to humans, too. 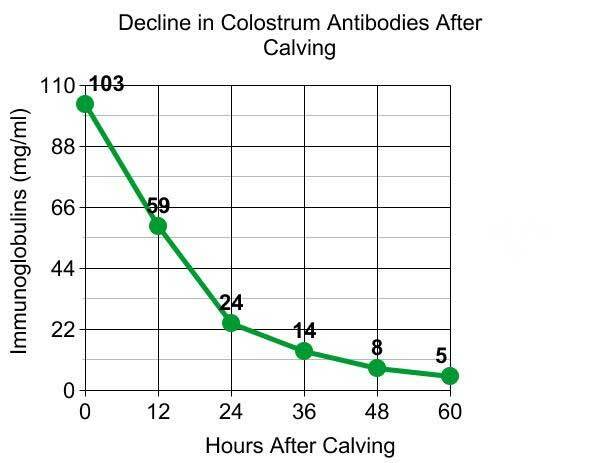 In truth, while there is a lot of variation in both quality and efficacy among the literally hundreds of products for sale out there, serious science seems to back up a lot of the claims: colostrum can be powerful medicine. What is it touted to do? A very incomplete list includes: helps to restore and reset the immune system, speeds healing of surgical wounds, burns, and skin injuries, alleviates asthma and other inflammatory diseases, boosts athletic performance and protects against numerous disease-causing pathogens. It's important to understand that the bevy of beneficial ingredients in colostrum (and all foods, really) are designed to work in concert with one another. In other words, there is a synergistic relationship among all the substances which fosters the health of the organism that consumes them. Individual components in overly processed colostrum, either damaged by pasteurization or deliberately separated out, can defeat this synergy and bypass natural systems of checks and balances, causing unwanted results. Stick with whole, unprocessed product wherever possible. Also, what the animal eats and how it's treated can have a major impact on the quality (and safety) of the end product. Unless you have access to a dairy farm or your own cow, the only colostrum you're likely to encounter will be in processed and/or supplement form. If you can find it straight from the cow, how much is enough? As with any new food, but especially with one as powerful as fresh, raw colostrum, start out with a small amount, say, half a cup, and see how well you tolerate it. Because we're all biochemically different, even that small amount may be too much. Experiment until you find a level that works for you. As if colostrum's healing powers weren't amazing enough, nature takes things one giant step further. It turns out, the cow's udder is, for want of a better comparison, an honest-to-gosh biochemical laboratory! Researchers discovered that injecting a pregnant cow's udder with pathogens or allergens caused the manufacture of antibodies to those substances which were then expressed in her colostrum, creating what's known as immune milk or hyperimmune bovine colostrum. Savvy scientists eventually injected blood from a patient into a cow's teat and soon discovered antibodies to that patient's ailment in the resulting colostrum. This is powerful, made-to-order medicine! 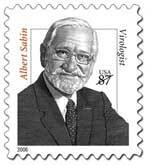 Pioneer virologist Albert Sabin (right 1906-1993) is said to have discovered anti-polio antibodies in cow's colostrum which eventually led to his oral polio vaccine. Perhaps he created them by taking advantage of the cow's remarkable udder. Ultimately, the discovery that cows could manufacture customized antibodies was patented (see U.S. Patent #3,376,198 for a great description of the process- it's a fascinating read). Why affordable immune milk is unavailable in the United States today is one of life's great mysteries, the answer to which might lie with the FDA and, probably, the USDA. As far as I can tell, the creation and use of immune milk in the United States is still illegal, at least for humans. In other countries, like China, for instance, millions enjoy its benefits. For agricultural use in America, however, the bovine-derived vaccine market is booming. Think of it. We have the technology to make a customized injectable vaccine that is completely safe and free of side effects, that is so inexpensive to manufacture it could be available to all, that jump starts the immune system and protects against bacteria, viruses, protozoans, fungi and allergens, and that is backed up by numerous studies attesting to its safety and efficacy. One's heart must ache at the thought of all the unnecessary suffering caused by the suppression of this amazing substance. Click here to read attorney Jonathan Emord's excellent speech that outlines why a certain agency in Washington is seriously in need of an overhaul!